Celia Sosa has worked as the principal of Hyde Leadership Charter High School for seven years. 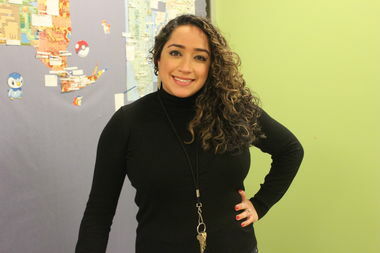 HUNTS POINT — Although Celia Sosa has worked as Hyde Leadership Charter High School's principal for seven years, she still considers herself a teacher at heart — only now the people she teaches are not just kids. "I’ve come to see myself as not just a teacher of students, but also as a teacher of adults," she said. "So I’ve embraced that piece of the role." Hyde first opened in 2006 serving only students in kindergarten and sixth grade, and Sosa came to the school as a teacher in 2007. "I was looking, I think, for just an alternative model and felt that there was so much that was possible here as a new school," she said. She took over as principal three years later and recently sat down with DNAinfo New York to talk about Hydes' philosophy of focusing on building students' character and involving parents in the school. Hyde Leadership Charter School is modeled after a boarding school in Maine, correct? We’re part of a family of schools. We have two boarding schools: one in Woodstock, Connecticut, and one in Bath, Maine, and it’s a family-based character education program. Simply put, the program calls for students, faculty and families to do a lot of action reflection. Like 'Who am I? Where am I going? What do I need to do to get there?' are three core questions that help guide us in the work that we do. We have here what we call "discovery groups," where each faculty member is married to a group of eight to 10 students, and those groups meet once a week. In those meetings, we're doing a lot of sharing personal challenges and how we've sort of picked the paths we've picked. In that way, there’s a lot of the blurring of the lines between personal and professional. If you’re someone who wants to leave work at work, then this probably isn’t ultimately a good place. We're looking to build a team that's sharing of themselves. So when you’re doing these reflections, people are encouraged to talk about other things going on in their lives? Yes, absolutely. We’re sharing with a purpose, so we're sharing things that happened in our lives that we think will benefit students. So there’s a line, but that line is not where I think a lot of other schools draw it. I think it lends itself to a community where there are a lot of close relationships between students and faculty. Is it helpful for you to know more about what’s going on in students' lives outside of school? Yes. Our family program is like no other. If what we're doing here is going to grow roots, it means that we're working with families and trying to do a good job of understanding what our parents care about. I think it’s challenging. Certainly if I think of when I was a teenager, it would have been difficult in school to be talking about stuff going on at home. What happened at home stayed at home, and I think it takes a lot of trust to get to a place where students and families understand that we’re going to be asking them to put their business out there. I think doing that ultimately makes families feel more welcome here. We want families to feel welcome and to be in this school for a variety of positive reasons beyond traditional academic conversations or trouble conversations. Our charter goal requires families to come to six or more events a year. Do you get any pushback from parents? No. Parents deeply love their children and want the best for them, and we understand that we’re on the same team here. We’re not judging how parents parent, but we provide a space where parents can critically think about their choices, both as parents and as people. We engage parents. Like, what are your goals, and where are you at in your life? Why do teachers at the school keep office hours? This is our second year dismissing students at 3:15. We used to dismiss most students at 4. At some point, the teenage brain shuts off, and while I don’t think the extended day was a mistake, I think it was the right move to make teachers available at the tail end of the day instead of to be plowing through until 4, 4:30 with students. And so there are schedules of office hours all around the building, and while certainly some students gravitate to the teachers they’re most connected to, all of their teachers are available at some point during the week for tutoring. What is the one of best things about working at Hyde Leadership? I’ve been in other schools. I’ve visited other schools as a principal, as a teacher. So many schools are doing great work, but I just can’t emphasize enough how truly special our culture is here. It keeps me here. It keeps faculty here. To really get folks thinking about the kind of people they want to be and how they want to live their lives, that’s our mission.